I don't think there is a more meaningful greeting or significant salutation given to man that this duet of grace and peace found in all Paul's letters. 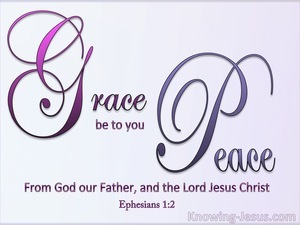 Grace is the highest expression of God's loving-kindness and benevolent blessings to man which is translated into God's unconditional, unmerited favour and showered in super-abundance on all who trust in His name. 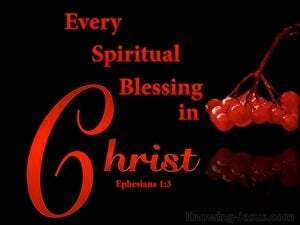 How we praise and glorify God, the Father of our Lord Jesus Christ, for He has poured out every single blessing in the heavenly realms upon us, simply because we are united with Christ by faith and are One with Himself. 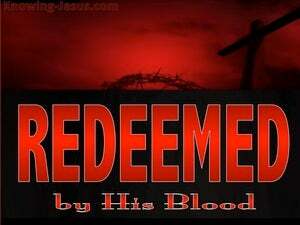 Should we not rejoice, for this is one face of the cut diamond of His grace with which God has chosen to bless us. God is no respecter of persons and throughout Scripture we discover verse after verse that reminds us that it was the love of God that caused Him to send His only begotten Son to die on the cross for our redemption… and it was by the grace of God that His free gift of eternal life is given to whosoever will believe on Jesus Christ as Saviour – that is all it takes. God created man in His own image and likeness and man enjoyed unbroken fellowship with His Creator God and walked and communed with Him in the cool of the evening - but through man's owns foolish rebellion and disobedience - man became servants of a cruel task-master - estranged from the God Who made us, and entrapped by Satan. We forever became slaves to sin and destined to an everlasting death - i.e. eternal separation from God. 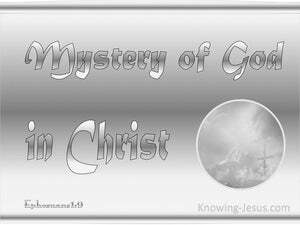 The coming of the Messiah was no hidden mystery, for it was foretold by the prophets of Israel, but God had kept secret one peculiar aspect of His marvellous plan, which He had purposed in Himself before the world was created. ere is probably no more vital truth for the Christian than to understand our current position in Christ and our future relationship to Him. 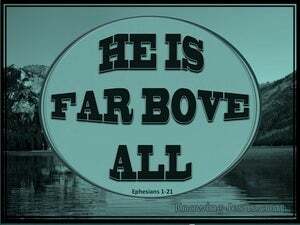 Before time began, God determined to gather all things together in Christ; to unite everything together in Him; to sum-up and bring into one final whole, all things in Jesus Christ the Messiah of God. 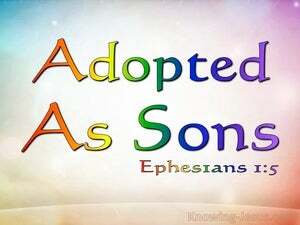 The first chapter of Ephesians is weighed down and running over with countless spiritual blessings in heavenly places, which God our Father has freely given to us - by grace, through faith in His only begotten Son. God has always worked through a little remnant and the apostle Paul was one of a small group of believing Jews who first trusted Christ as Saviour - and through whom the grace of God was made manifest to a world of lost sinners, to the praise of His holy name. 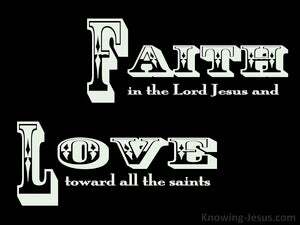 Faith comes by hearing the pure message of truth in the Word of God.. the gospel of our Salvation. 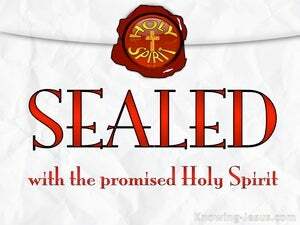 And Paul rejoiced that when this group of Christians HEARD this message of truth, (the gospel of Salvation) they BELIEVED - and when they believed they were immediately SEALED with the promised Holy Spirit. Contracts, treaties and engagements can be all broken. People can renege on their promises and can even forego a financial down-payment to wriggle out of a commitment or covenant. But this is not the case with God. 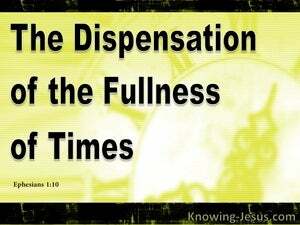 We have been purchased for God with the blood of Jesus Christ, and the Holy Spirit is His down-payment to us. Imagine receiving a letter from the apostle Paul. 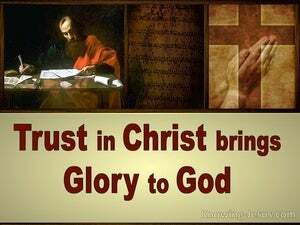 He had been chosen as God's apostle to the gentiles and had been entrusted with the mysteries of Christ and the Church, which had been kept hidden for ages and generation. 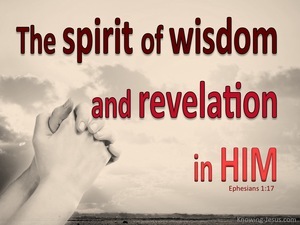 Paul is a man who recognises the importance of lifting up other believers in prayer to the Father, so that we may be spiritually enlightened and spiritually enabled - so that we may come to a deeper understand of who we are in Christ and what He has done for us. Paul's teaching equip us to live our “new life in Christ' to His praise and glory - not only in what we do but in who we are. Paul's ongoing and continuous prayer for all God's children is that we may grow in grace and wisdom. 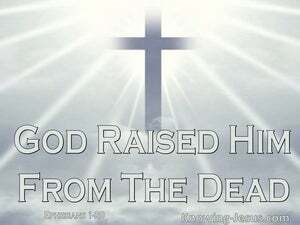 He prayed that we wold increase in understanding and knowledge and be granted greater illumination and spiritual revelation of our Father in heaven and His anointed Son - Jesus Christ, Who died for our sins and rose again the third day, to give us His abundant life, according to the riches of His grace. 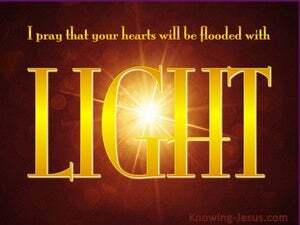 All believers have been called by grace, out of darkness into His glorious light. 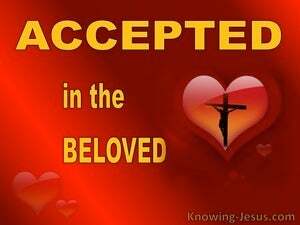 We have been called by grace, to glory. 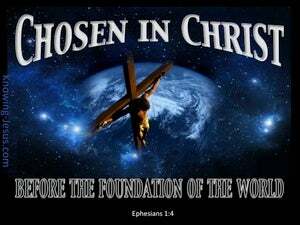 We have been called, chosen, justified and glorified for we are saved by grace through faith in Christ and are become his chosen people, a royal priesthood, a holy nation. 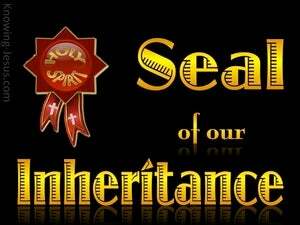 We are God's very special possession - His glorious inheritance. There is no god like unto our God. The infinite strength of His pre-eminent might and His superlative power is unsurpassed in time; through space and into eternity. 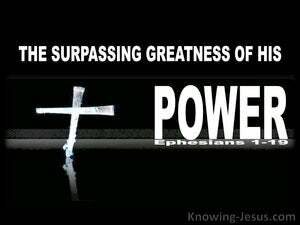 And this surpassing greatness of His power is directed towards one little group of blessed people - a peculiar people who were once dead in trespasses and sins... a little flock who have trusted in the Lord Jesus Christ as their Saviour. 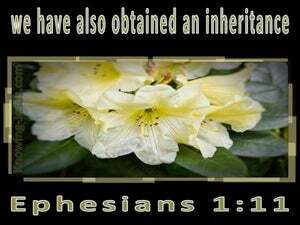 The love of God is demonstrated to believers through the glorious inheritance that is ours in Christ. 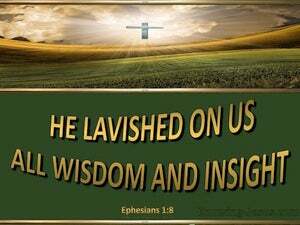 God's love is evidenced by the glorious position that we have in Him - the glorious future that we have been promised and the glorious hope we have, as His precious possession, for we were bought with a price. God's gracious promises towards His children and the surpassing greatness of His mighty power towards all who believe in Him, is the confident hope that we have in Christ Jesus our Lord, which was accomplished when God raised Him from the dead and seated Him at His right hand on heaven's glorious throne. 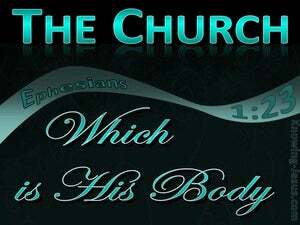 Because we are in Christ and have become members of His body we have been lavished with all kinds of spiritual blessings, by grace through faith. Christ laid aside His heavenly glory to live in humble submission to the Father, doing only those things that He heard from Him, so that we might be forgiven and become a new creation in Christ. 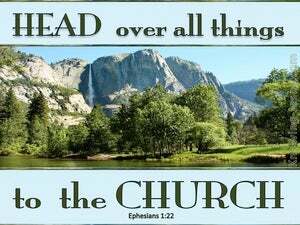 And because of His obedience, God made Him universal ruler placing ALL things under His feet.